Product ID: 15 mm, OD:18mm, Length:310mm, wall thickness 1.5mm , 4 cavities. 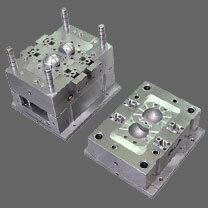 We've decided to plan the following part to be molded, after making, in 130T machine. Also for this product to provide the core pulling we've worked out as below, please ensure and advice is this correct. For Del. Temp = Softening Temp - Mold Temp. Soft. Temp = 100 deg Cen. Mold Temp = 30 deg Cen. By applying all the above it is arrived per cavity about 3.4 KN force will be required to pull out the core, then for 4 cavities and multiplying by 1.5 as w.o spring load concept consideration, total force needed to pull out the 4 core pins for this 4 cavity mold will be around 21 KN or 2140 Kgf. Draft will be, for the ID:15mm, the core pin dia will be at the end it is Dia 15mm and in the bottom 14.1, even the core pins are provided as two halfs (155mm Length each) to match the overall length 310 from top and bottom. Both side the core pulling will be done. I see that you are pulling the core pins from both ends. And also that you have draft from each end core pins are smaller diameter in the middle of the part. Your draft angle is less than 1 degree per side and this will be a problem. I expect that you will still have a vacuum (sucking) problem during core pin ejection which might cause the part to slightly collapse in the middle area. Also, are the core pins from each side interlocked?-----Perhaps with a "Bullet Nose Pin" on one side and a Hole on the other side so that you maintain concentricity during resin injection. These Core Pins will also run very hot since you will not have water channels in them. You may have to detail a hole through the core pins to eliminate the vacuum effect during ejection. If you pull both core pins out of both sides, where does the part go when the tool opens? A or B side? What controls the part when the tool splits? In order to pull the core pins you must keep the tool closed (but release the clamp force and give the core pin shoulders a very slight clearance) so that the part is supported and is held in place while the core pins eject.